I have a confession.... Until today, I have never tried a white chocolate mocha. I've always wondered what it would taste like, though. So, because we are right in the middle of our 12 Days of Mochas I thought it was the perfect time to try it. And I have to say... It is AMAZING!! This mocha is now at the top of my favorites list. But though I wanted to add white chocolate into my mocha, I wasn't sure how to go about it. White chocolate can be really sweet. I prefer to taste the coffee without the chocolate totally overpowering it. A well balanced cup is what I was going for. 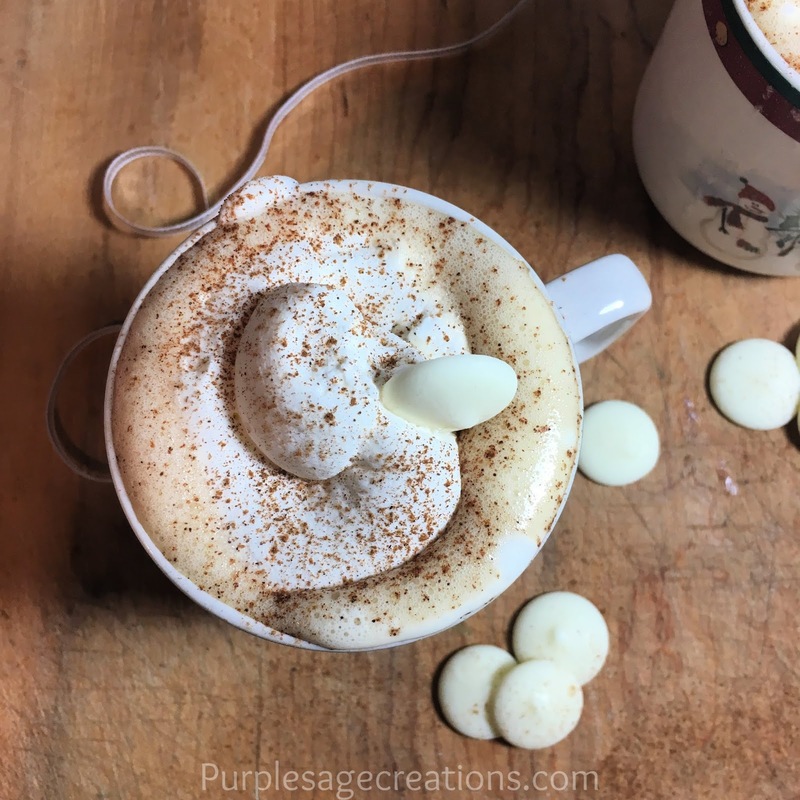 I also wanted to try a different method of making a quick homemade mocha latte. 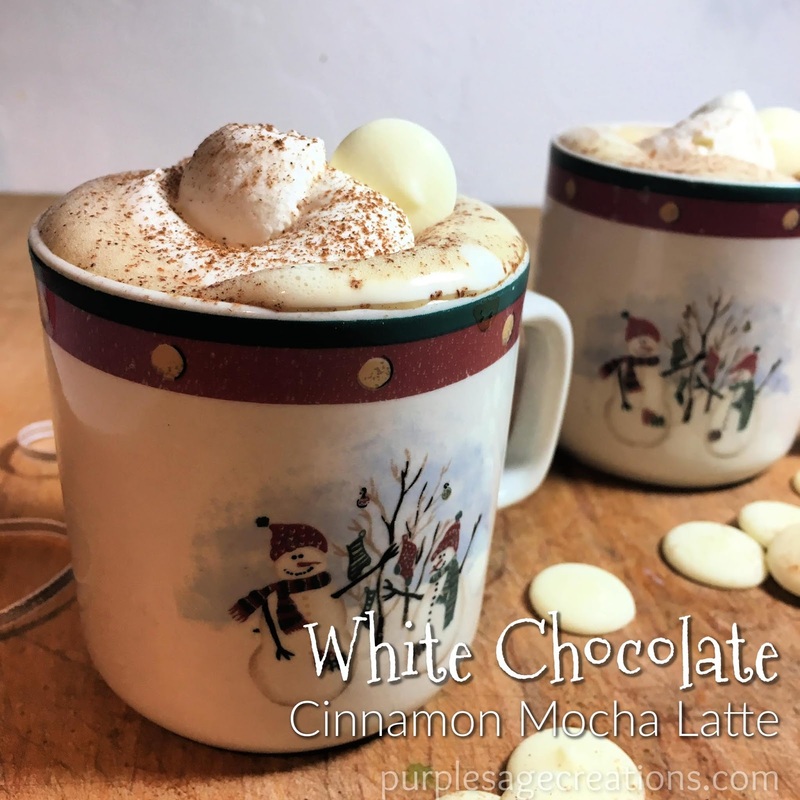 I've featured mochas made with syrup and cocoa with sugar. But I've noticed some recipes around the web that use baking chocolate or chocolate chips. So that's what I went with for this recipe. 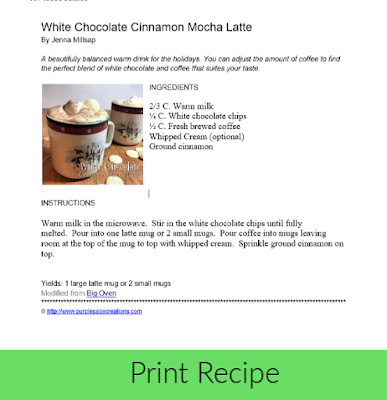 It's a pretty simple recipe, though the milk is not frothed like in my other mocha recipes. Simply warm up the milk, on the stove or the microwave, and add the white chocolate chips. Stir until melted. Add to your mug with fresh brewed coffee. Top with whipped cream and ground cinnamon. Then sit back and enjoy! Warm milk in the microwave. Stir in the white chocolate chips until fully melted. Pour into one latte mug or 2 small mugs. Stir in coffee, leaving room at the top of the mug to top with whipped cream. Sprinkle ground cinnamon on top. The amount of coffee vs. chocolate milk is totally up to your taste preference so play around with it a bit. The whipped cream is optional, but I highly recommend including the cinnamon. It makes it a delectable holiday drink.